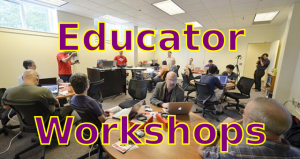 I offer a wide variety of workshops on technology, professional development, art and programming. I’d love to give you a customized workshop if you can’t find one that interests you in the links above. I’m completely mobile so the workshops happen wherever and whenever is the best for you. Interested in helping your child learn how to program? Start them learning as young as the age of seven with the fun and intuitive programming environment called Scratch. Students will use drag and drop programming to create an animated character that moves around when they press keys as well as discover other fun things to program in Scratch. Details about Scratch are available at http://scratch.mit.edu. Cost- $20 an hour for the first student, $10 an hour for each additional student. Workshop setup and breakdown is included for no additional fee. 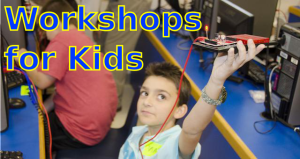 Interested in helping your child learn how to program? Start them learning as young as the age of seven with the fun and intuitive programming environment called Scratch. Students will use drag and drop programming to create an animated character that moves around when they press keys as well as an introduction to video game coding. What video game is complete without some bad guys, bonuses and storyline? In this two day workshop students will create a basic video game or application the first day and flesh out their project the second day by adding levels, a point system, graphic user interfaces or sound. On the second day students will also plug sensors called Picboboards into their computers and integrate them into their scratch projects. Interested in helping your child learn how to program? Start them learning as young as the age of seven with the fun and intuitive programming environment called Scratch. Students will use drag and drop programming to create an animated character that moves around when they press keys as well as an introduction to video game coding. Students will create a basic video game or application and flesh out their project by adding a point system, some sound or other possibilities. During this workshop students will plug sensors called Picboboards into their computers and integrate them into their scratch projects. Go from blinking an LED to virtual prototyping in seven hours and still have time to eat lunch! This class is for anyone who has never played around with Arduino before and those who have played around a little bit but aren’t entirely sure about how the basics work. It’s easier than you think! We will put together basic single component electrical circuits, learn about analog and digital, input and output, basic programming concepts and practice very basic Serial communication. Students will create three simple circuits highlighting analog and digital forms of input and output. Get started with the Arduino programming environment, briefly discuss programming and virtual prototyping. I’ve taught this class far more times than I can remember, I tailor this class depending on the audience’s experience level and interests. Details about Arduino are available at http://www.arduino.cc/. Cost- $30 an hour for the first student, $10 an hour for each additional student. Plus hardware costs. Workshop setup and breakdown is included for no additional fee. Texas Instruments developed a system that is very similar to Arduino called Launchpad. Go from blinking an LED to virtual prototyping in seven hours and still have time to eat lunch! This class is for anyone who has never played around with Arduino before and those who have played around a little bit but aren’t entirely sure about how the basics work. It’s easier than you think! We will put together basic single component electrical circuits, learn about analog and digital, input and output, basic programming concepts and practice very basic Serial communication. Students will create three simple circuits highlighting analog and digital forms of input and output. Get started with the Energia programming environment, briefly discuss programming and virtual prototyping. Energia and LaunchPad are low cost, low energy microcontrollers that are very similar to Arduino. Details about Energia are available at http://energia.nu/. Have you ever wondered how basic electronics work? Learn about components, polarity, and basic electronics theory. Concepts we will cover include how to use a multimeter, parallel and series, resistors, voltage dividers, capacitors and basic sensors. 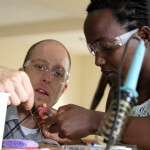 This is a fact filled workshops where students get to work hands-on with circuits and breadboards. All digital systems are based on boolean logic, a one and a zero, true or false, but how exactly does that work? This workshop explores Boolean Logic first through transistors based logic gates on a breadboard and the with Logic Blocks, an electronics teaching tool developed by SparkFun Electronics and I. Student will learn the basic concepts required to understand how chips, memory and oscillation work as well as working with the boolean gates NOT, OR and AND. Learn the basics of computer programming with Processing, a programming environment that allows artists and designers to quickly create fun and interactive programing in Java and other programming languages! Because it’s Open and has a large community Processing allows beginners to get started quickly and has enough libraries that more advanced users can find code examples to pursue almost any concept, from video game design and internet connectivity to Android applications and hardware integrations. Come learn the basics of computer programming while making a simple character move around the screen. Depending on how much time we have we can even get into animation, importing images and other concepts. Details about Processing are available at https://processing.org/. Have you ever wanted to control a robot from your laptop or desktop computer? Then this workshop is for you. We’ll click on a button on our computer screens and light up an LED or move a servo for starters! Then we’ll move a slider on the screen and make some (horrible) electronics music through a buzzer! Once you learn the basics the possibilities are endless. In this workshop you will learn how to make very basic Graphic User Interfaces (GUIs) that interact with an Arduino microcontroller and sensors. Learn how to use and configure Bluetooth to talk between your computer and a robot! Send commands from a Graphical User Interface program to a microcontroller with sensors or actuators nearby. We will do things like send AT commands to the Bluetooth unit to establish the speed of communication, light up LEDs, use the Bluetooths to control the position of a servo. We will also discuss how to configure Bluetooth parameters themselves over Bluetooth Serial communication. Learn exactly how a breadboard works by creating a functional 10X breadboard and components. Great for use as a teaching tool in the classroom, based on a design by Mike Hord and the Twin Cities Maker. Students can create either a full size breadboard complete with center ravine and power rails or students can create a smaller half size breadboard. Giant components I have created include- Resistors, capacitors, dials (or trimpots), LEDs, photoresistors, buttons, an ATMega 328P PTH chip, a piezo buzzer and a battery. If you’re really into this stuff we can go as far as creating giant functional chips as well as the other components. Cost- $20 an hour for the first student, $10 an hour for each additional student. Plus hardware costs. PCB milling, workshop setup and breakdown is included for no additional fee. This workshop will cover the basics of through hole soldering, also known as plated through-hole soldering (PTH), discuss the tools needed, go over techniques for proper soldering and show you where you can go from there. We will also discuss rework as it pertains to through-hole soldering and give you some tips and tricks that will make fixing almost any piece of electronics a breeze. This workshop can be for beginners and experts alike. Whether you’ve never touched an iron before or are looking for a little refresher, this workshop has a little something for everyone. Ever wondered how people work with those tiny components and chips you see inside your electronics? You’re in luck! This workshop will cover the more advanced soldering known as surface mount device soldering (SMD), discuss the tools needed, go over techniques for proper soldering and show you where you can go from there. We will also discuss rework as it pertains to surface mount device soldering and give you some tips and tricks that will make fixing almost any piece of electronics a breeze. 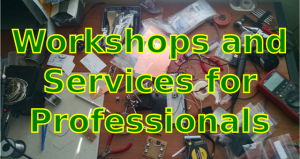 This workshop is for people looking to step up their soldering game and experts alike. Whether you’ve never touched surface mount device before or are looking for a little refresher, this workshop has a little something for everyone. Learn the basics of fixing broken electronics. We’ll cover tools, maintenance and discuss various soldering techniques as well as will fix broken PCB traces and address how to deal with a pulled Via or SMD pad. We will also cover “green wire” fixes, IC adjustment, removal and replacement. Whether you’ve never touched surface mount device before or are looking for a little refresher, this workshop has a little something for everyone. Cost- $30 an hour for the first student, $15 an hour for each additional student. Plus hardware costs. Workshop setup and breakdown is included for no additional fee. In this workshop we will cover a production technique for soldering surface mount technology known as stencil soldering, discuss the tools needed, go over techniques for proper stencil soldering and show you where you can go from there. We will also discuss rework as it pertains to production techniques, board testing and programming. We will use a rework iron to heat the solder but we will discuss reflow techniques and technology. This skills is exactly where anyone who wants to step up to in house production should start. Got an idea for a prototype but not sure exactly how to make it happen? I offer five days of prototyping skills from schematic to breadboard to PCB designs and the skills to turn that PCB design into a finished project as well as concentrating on additional concepts to be chosen by student(s). The class will start with a discussion of the design process, sourcing parts and datasheets as well as how to create schematics, logic charts and pseudocode. The second day will be an Introduction to Arduino. The third day will find us practicing some of the embedding skills necessary for creating electronic prototypes by soldering (PTH, SMD or stenciling) or sewing circuits using e-textiles technology. 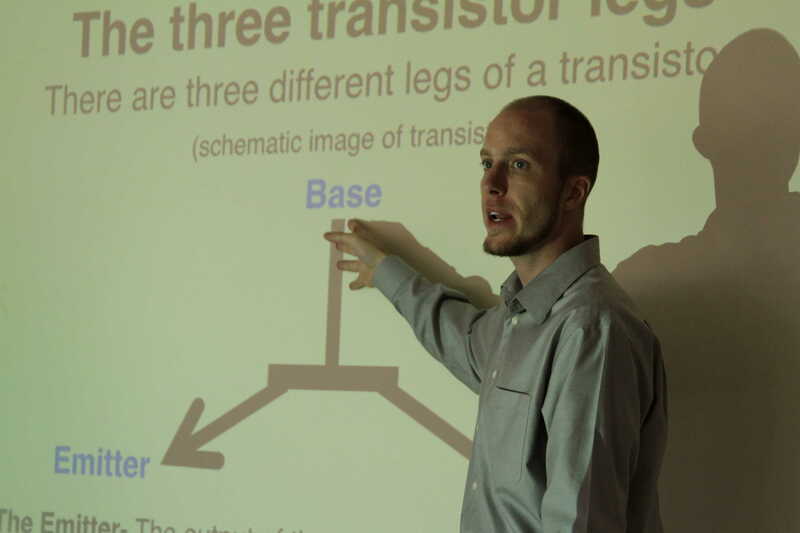 The fourth day is an introduction to Processing or PCB design depending on student interest. The fifth day is reserved for a final concept (to be decided in class) or continued work on students’ prototype projects. Kids need to get their energy out- computer programming and prototyping are great skills but it’s not good for them to spend all their time in front of a screen! Kinesthetic activities are a great way to learn basic computer programming concepts while moving around. 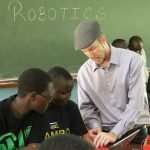 I have created five different activities that effectively teach core computer programming and robotics concepts through physical activities on the recess playground or fields. Concepts covered include- Actuators and sensors, sensor readings and data resolutions, serial communication variables and code iteration. Cost- $20 an hour for the first student, $10 an hour for each additional student. Plus hardware costs. Workshop setup and breakdown is included for no additional fee. Don’t see what you want? I specialize in specialization! Let me know what it is you want to learn. We’ll spend some time before the first workshop day deciding on the skills and concepts you wish to focus on to realize your goal. I’ve create a lot of curriculum over the years and I’ve taught to a wide variety of skills levels, cultures and ages, I relish the opportunity to create a customized experience for my students. Let me know what you find exciting about technology (for example- video games, robots, art, sensors, wireless, magnets, etc.) and what other subjects you are interested in combining with technology and we’ll figure out the best way for you to pursue that passion! Cost- $30 an hour for the first student, $25 an hour for each additional student. Plus hardware costs. Workshop setup and breakdown is included for no additional fee. Have an idea for a workshop that you want to try out? I’m great at creating curriculum and materials as well as teaching, contact me and we can put the finishing touches on your idea and deliver the workshop together. Number of students not to exceed ten without prior arrangement and/or assistive instructors. Special discount pricing available for schools, museums, homeschoolers and other organizations that provide assistive instructors. Final payment for workshops must be made no later than one week before the date of the workshop, unless otherwise arranged. Unless we have arranged otherwise all students or host organizations are responsible for providing a computer for each attendee. Hardware costs will be applied to any workshop with consumables. Hardware is available for purchase with workshop, for details contact us. Additional services- Curriculum Development, Consulting, Research & Development, Art Installations.